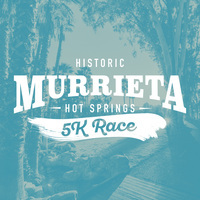 Join us for the Historic Murrieta Hot Springs 5k race on December 21st, 2019! Runners will pass natural hot springs, a lake, palm trees, flowers, and mosaic tiled paths as they race through our beautiful and historic 46 acre property. View the race map video. 100% of the race proceeds will support college scholarships for international and domestic students with financial needs. We’ll be using digital time tracking and your results will be posted online instantly. The 5k race will have a start time of 8:30am and the 5k walk will have a start time of 9:30am. The Kids Fun Run 1k will begin at 10:30am. (1) T-shirt, (2) race bib, (3) finisher medal, (4) welcome packet, (5) bottle of water, (6) and fruit. Tickets: A ticket with a barcode will be emailed to you for check in and is also available in the My Account area of this website. Parking: Portions of the parking lot will be closed at 8:15am to secure the course for safety so please arrive early. You may pick up your race t-shirt and race bib on Thursday, December 19th and Friday, December 20th from 8:30am – 7:00pm or on race day between 7:00am – 8:15am.